The parents of missing Madeleine McCann have returned to the UK saying they are "heart-broken" to have left Portugal without their four-year-old daughter. At East Midlands Airport, an emotional Gerry McCann said they had returned for the sake of their twins and he appealed for their privacy to be respected. He said he and his wife, Kate, both 39, had played no part in the disappearance of their "lovely daughter" on 3 May. The couple, who are formal suspects, have arrived home in Rothley, Leics. They were greeted with a heavy police presence and a large crowd of reporters and cameras. During their absence, letters, cards and presents for Madeleine have been posted through their front door. Kate McCann's uncle Brian Kennedy, who had been waiting for the family to arrive, told reporters they had a "mixture of feelings" about being at home. "They're back to their own house after three or four of the most trying days they've probably ever been through," he said. "You will know how long they were with the police in Portugal... they're tired. They're very tired." Kate McCann's mother, Susan Healy, told BBC News it was a relief to have the family back home. "I understand how difficult it is for Kate, just walking across the threshold of the house," she said. "And I have spoken to her, and she's been into Madeleine's bedroom, which I know must be heartbreaking for her. "But, having said that, I think the time had come where they weren't really being productive in Portugal." 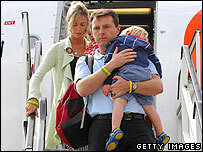 At East Midlands Airport, a large crowd of people had gathered in the hope of catching a glimpse of the McCanns. Mr McCann stood on the runway next to his wife, each cradling one of their twins in their arms, and read a statement to the gathered media. With emotion breaking his voice, he said: "We want the twins, as much as is reasonably possible, to live an ordinary life in their home country, and want to consider the events of the last few days, which have been so deeply disturbing. "Despite there being so much we wish to say we are unable to do so, except to say this: we played no part in the disappearance of our lovely daughter, Madeleine." He also said they had left Portugal with the full consent of the Portuguese police. Chief Inspector Olegario Sousa told news agency Associated Press that the police investigation "is not over by any means". "The investigation will only end when we think the case file is complete and we hand our findings to the public prosecutor, who then decides whether to drop the case or bring charges," he said. The McCanns had planned to leave this weekend, but changed their minds after they were named as suspects, or "arguidos", by Portuguese police - a move which allows detectives to ask them certain questions, and also gives them the right to remain silent. Early on Sunday they decided to stick to their original plan, but they could be asked to return to Portugal at a later date for further questioning. As formal suspects - a status they may hold for eight to 10 months - the McCanns would be obliged to comply. No bail conditions, travel restrictions or charges have been imposed on the couple, who had been questioned separately for more than 24 hours. Police in Portugal are now waiting for the results of tests being carried out on forensic evidence by the Forensic Science Service in Birmingham. During an 11-hour interview, detectives suggested to Mrs McCann that traces of Madeleine's blood were found in the family's hire car. The family say this is impossible as they did not rent the vehicle until 25 days after Madeleine disappeared. Mrs McCann told the Sunday Mirror that during the interview, Portuguese police put her under pressure to confess that she killed her daughter by accident. She said that police "want me to lie - I'm being framed". Her husband Gerry told the News of the World that Portuguese officers were looking for a quick end to the case and were exploiting apparent discrepancies in the couple's account of what happened. He said: "In a system that you don't know and don't really trust it's incredibly frightening." Due to legal restrictions on police under Portuguese law, they are unable to respond to the claims made by the McCanns. However, Home Secretary Jacqui Smith has said she is satisfied with the way Portuguese police have conducted the investigation.